Describe sample use cases for the platform. Discover resources for using the platform across multiple departments. The platform helps you move fast. Part of that speed comes from replacing tasks you’re used to doing by hand with more streamlined processes. So let’s pause for a moment to talk about some ways the Salesforce platform can accelerate your business. When you’re learning to build on the platform, the first things you want to tackle are projects that have big impact but are easy to implement. While that sounds idealistic, the platform gives you lots of opportunities to make big changes with minimal effort. Let’s think about an example from DreamHouse. Michelle and her fellow brokers often use email to discuss particular properties. Sometimes, Michelle participates in multiple threads discussing the same property and that can get confusing. Between all the emails, details get lost. And when brokers overlook a detail, they can miss out on a sale or make a mistake that impacts the buyer. So how does the Salesforce platform help this issue? Well, for DreamHouse Realty, D’Angelo created a custom Property object, which we saw in the last unit. Every time you create a custom object, you automatically get something called Chatter feed tracking. Chatter feed tracking provides a way for multiple people to comment and collaborate on a particular record. The discussions and decisions are stored on the record so everyone can stay up to date on important decisions. Now Michelle and her brokers don’t have to use email anymore for their discussions about a specific property. Processes with these traits are great candidates for early projects on the Salesforce platform. 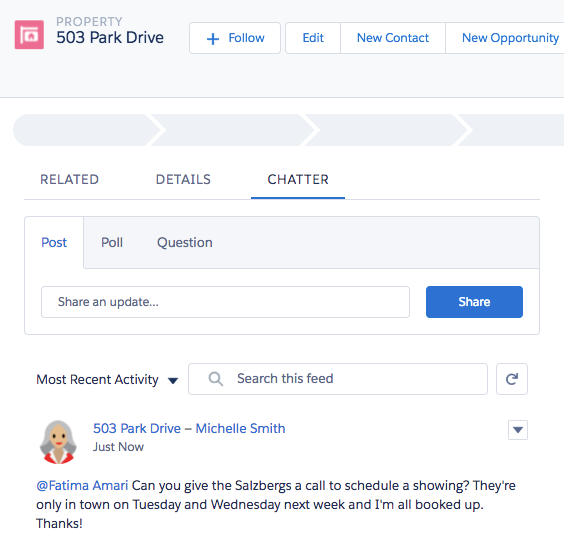 In our DreamHouse story, we’re using Salesforce to help real estate agents sell houses better. But you can customize the platform to aid in a lot of other business tasks, and not just for the Sales department. Let’s take a look at a couple other ways you can build on Salesforce. Julian, who works in the DreamHouse HR department, is in crisis. He has hundreds of applications coming in for dozens of job openings. Once applicants are hired, Julian has to set up training and submit hardware requests. All this activity creates a lot of data, and Julian is struggling to manage it all. Using the Salesforce platform, D’Angelo can create a custom app that helps DreamHouse’s HR employees streamline and automate the hiring and onboarding process. Here are some things the custom app can do. Store applicants for each job opening. Send automated reminders to hiring managers. Store orientation and training plans. Like any app built on the platform, the HR app D’Angelo creates is available for the Salesforce mobile app. That way, HR reps can manage applicants and new hires whether reps are in the office or off at a recruiting fair. Cool! Over in IT, Regina is also feeling the burn. She’s getting a million IT tickets coming in every minute and everyone’s problems seem to be urgent. Who could she possibly ask for help with this torrent of tickets? You guessed it. Her friendly neighborhood Salesforce admin, D’Angelo. Create reports and dashboard to aggregate and analyze requests. Send confirmation emails when requests are received, completed, or updated. Create custom forms for employee requests and create a knowledge base for common issues. With a streamlined IT process, users are happier and IT has more time to build infrastructure rather than maintain a separate system. By now, you’re probably getting some ideas for projects of your own. Here are a few use cases for different departments. If you’re looking for more inspiration, check out some of the ways Salesforce customers are using the platform in the resources section.